Judge Terrence R. Nealon issued an interesting decision on July 19, 2010 in the case of David J. Sedor, M.D. et al v. Community Medical Center et al, No. 05 CV 2143 (Lacka. Co. July 19, 2010, Nealon, J.). In this Opinion, Judge Nealon reviewed the relevant factors that governs every duty analysis in a thorough manner and with a writing style that I submit would have made Dean Prosser and Justice Cardozo proud. This case arose out of an incident during which a noted local neurosurgeon was struck by a hospital bed as it was being pushed through the hallway of a hospital with the gratuitous assistance of an orthopedic implant sales representative. The Plaintiff, Dr. Sedor alleges that his injuries from this event and associated infections required him to eventually undergo a mid-thigh amputation of his right leg. 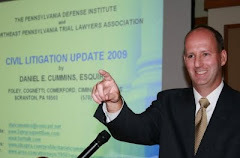 Judge Robert Mazzoni of the Lackawanna County Court of Common Pleas previously granted the Defendant implants distributor partial summary judgment finding that it could not be found vicariously liable for the actions of the sales representative as a master-servant was not established in that regard. The latest Opinion, from Judge Nealon, addressed the implants distributor's follow-up motion for summary judgment which asserted that the Plaintiff was also unable to establish the duty and causation elements of a negligence cause of action for direct liability. Judge Nealon reviewed in great detail the five factors involved in the question of whether a duty exists in a particular case: (1) the relationship between the parties; (2) the social utility of the defendant's conduct; (3) the nature of the risk and the foreseeability of the harm incurred; (4) the consequences of imposing a duty upon the defendant; and (5) the overall public interest in the proposed solution. The application of the above factors to the case at hand led Judge Nealon to conclude that the record did not support any finding that the implants distributor had any duty to instruct an independent contractor's sales representative who was involved in the incident to refrain from handling another party's equipment. More specifically, the Court found that the Plaintiff neurosurgeon had not established that the distributor owed a duty to train a non-employee not to handle or transport beds in a hospital as alleged in the Complaint. As such, the motion for summary judgment filed by the implants manufacturer and distributor was granted.